Welcome fellow Downton Abbey fans! 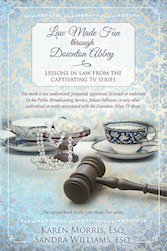 If you love Downton Abbey, and are curious about the law, this book is for you. It explores the intersection of the exploits of the characters in the public television series and the law of our society. You may have watched all the episodes in all the seasons of the series and yet never realized that the stories include many legal issue. Or you may have identified legal matters in the show but never knew if they were true-to-life or just literary license. This book will expand your horizons by introducing you to the law using the ventures of Lord Grantham, his family, and servants as the guide. Neither this website nor Law Made Fun through Downton Abbey was authorized, prepared, approved, licensed or endorsed by the Public Broadcasting Service, Julian Fellowes, or any other individual or entity associated with the Downton Abbey TV show.